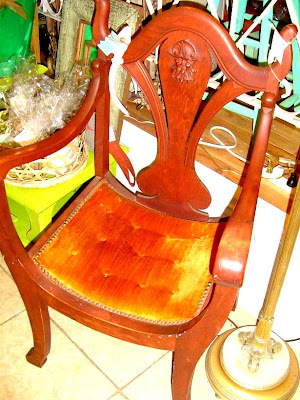 American Empire-styled furniture dates back to early 1800-1840s. It is a take-off from the French Empire style of furniture, popular during Napoleon's reign and reflects the majesty of that time. American Empire style is much plainer than the French version. We currently have a nice example of American Empire-styled furniture at Mignonne with this simple yet masculine armchair with great Empire lines. Upholstered with tufts, lovely curving arms and embellished with a carved wood relief depicting a fiercely royal visage, this chair would make an interesting accent in your home. Reuse ideas for glass candle holders. Flock Textiles - New Arrivals at Mignonne! Sweetheart Party & Sale at Mignonne! Love is in the air ... and so is Alma Chocolate! New Artwork by Diana Blackwell!